Do you have some Kriti trivia to share with us? Did you know that Jennifer Aniston has Cretan heritage? Well, her father's real name is Anastasakis. So if you know a little about Greek names, you will know that the end of the name is a real give-away as to where that person comes from. So generally Cretan names end in –akis. Yes, Jennifer does have Cretan heritage. Ioannis Anastasakis, her father, was born in Chania in 1933 and left for America with his family in 1935. He is best known for his portrayal of the bad guy Victor Kiriakis on the TV soap opera 'Days of Our Lives'. Jen did live in Greece for a year when she was five or six years old, and spent some time in Crete. If she does return, let's hope she will find some peace and quiet away from the paparazzi. Thanks for all the laughs, Jen. Here is a video of Jen speaking about her time in Crete and Greece. Here is a video of Jen's Dad talking about his family and Greek heritage. Did you know that Zorbá the Greek was really Cretan? Well, the novel Βίος και Πολιτεία του Αλέξη Ζορμπά was written in 1946 by Crete’s beloved author Níkos Kazantzákis and the film from 1964 was shot on location in Crete. Remember to put the stress on the last letter of Zorbá. It sounds better that way, don’t you think! The wild, enigmatic and loveable Zorbá played by Anthony Quinn comes very close to showing the heart of the Cretan character. Did you know that Anthony Quinn had played a Greek resistance fighter in the Guns of Navarone 1961, alongside Gregory Peck. 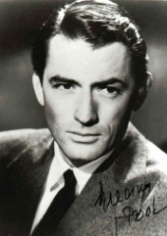 Just remember that the movie Guns of Navarone was not shot in Crete, it was shot on location in Rhodes (and it’s a nice excuse to put Gregory Peck’s photo here anyway). More Kriti trivia; Anthony Quinn is not Greek, although he plays it so well, he has Mexican-Irish heritage. Featuring in Guns of Navarone was Greek actress Irini Papas. Irini Papas also starred in Zorba the Greek, which was filmed in Chania town and the Akrotiri peninsular, as well as the village of Stavros. The film won three Academy Awards, although Anthony Quinn did not win best actor, he was nominated for it. Irini Papas is not Cretan, she is a talented and beloved Greek actress born near Corinth. Want more Kriti trivia? Míkis Theodorákis wrote the music for the film Zorba the Greek. Theodorákis is a very well know Greek musician and composer, whose father was Cretan. Míkis was actually born on the island of Chios. See our other page about this important voice for Greek resistance. 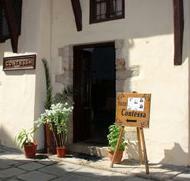 Did you know that the Contessa Hotel (left) in Chania is the same hotel that appeared in the movie "Zorba the Greek". The character Zorba emerges from the hotel delirious after a night of wild partying with the local lady of the night. This hotel still stands today and is run by Giorgos, who appeared in the film as an eight year old, and remembers the film shoot and all its excitement back in the early 60's. Did you know that BBC filmed a TV series called Who Pays the Ferryman? in Elounda in eastern Crete in 1977. The music was by Giannis Markopoulous. 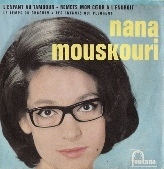 Did you know that Nana Mouskouri was born in Crete? Yes it is true, one of the most prolific and adored Greek music artists, Nana Mouskouri was born Ioanna Mouskouri in Chania in 1934 and left for Athens with her family when she was three. Did you know that the novel 'The Island' was set in Crete? 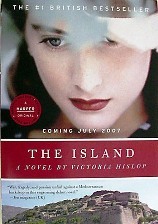 This 2005 book by Victoria Hislop became very popular and gave rise to a Greek TV drama also simply called 'The Island' or 'To Nisi' directed by Theo Papadoulakis, drawing on the rich history of Crete. Theo Papadoulakis also directed this spot - 'European Athletics Team Championships 1st League 2015'.